A Life of Sugar and Spice: So much to say, so little time! I went to Good Health AGAIN last night for some more stuff. Here's the thing, I've decided to cancel my vacation to the Dominican Republic :::sob::: because in these difficult economic times ::gag:: I can't in good conscience take a luxurious vacation while our business is in turmoil. So, all of that money I had put aside is now back in my wallet. Well not really, it's in my savings account, just in case I need it. To cover a week's worth of pay. Or to buy new clothes for those interviews/that new job I just might need. Or to buy that KitchenAid stand mixer I've been lusting after. Ok well that last one is a luxury, but if I'm not going on vacation, I've got to give myself something right? I'm still deciding on the mixer. Anyway, so I've been spending extra money on GF goods. I got myself awfully sick last week after a long gluten-filled bender so this week I've been super careful. I think I lost like 10 pounds this morning in one trip to the... well you don't want to hear abou that. Yeah, so I've been eating a lot of good stuff. Many of the things I'm eating are not new to you all, but they are new to me so I will blog about them. I know I have readers that are new to the GF lifestyle so I try to blog about, well, every single GF item I put in my mouth. Ummm.. ok, not every single item. 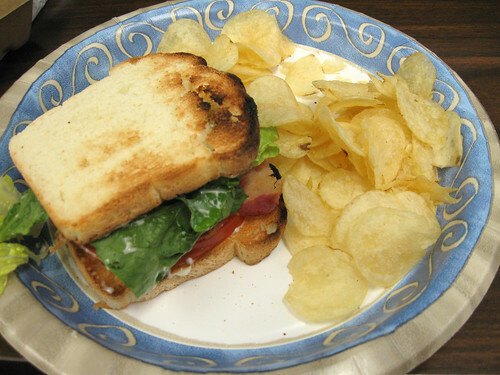 Today's post is about the delicious sandwich I had for lunch today. At Good Health they have this bread that comes from a bakery in Canada - Sterk's Bakery - and it always looks good but I never buy it. I can't remember exactly why, but I think that when I first started going GF I bought a loaf that was moldy and it soured the experience. Well last night they had a fresh shipment and I went buck wild and bought a loaf of the plain sandwich bread. This bread is not frozen, it is vacuum sealed, so when I got home I immediately packaged it for the freezer but when I opened the pack, the overwhelming smell of fresh bread knocked me down so I had to try some. I opted for toast, with my hot dog omelet (an old family fav! using Boar's Head hot dogs - GF/Dairy Free). SO delicious!!! The most like normal white bread ever. The slices are not too thick, they're soft and chewy, and they're good sized. They break apart easily especially at the top, but with extra care they stay together ok.
As you can see, today I had some more for lunch. BLT style. Boar's Head has taken over my supermarket with their clearly labeled gluten-free products. Thank You Boar's Head!! I knew their deli meats were GF but I don't love deli meats so don't buy them often. The bacon was the kind that you throw in the microwave for 30 seconds which I love. And of course, UTZ chips on the side. Everything I've eaten today was clearly marked GF, I love that labeling is getting so much better! I have so many other products to blog about, as I said yesterday, granola bars, cookies, crackers, chips, I finally bought xanthan gum! This morning I tried the Maple and Raisin with Flax oatmeal. It was great!!! And with fiber and protein, it kept me satisfied until after 12pm which is awesome. Stay tuned for more product reviews!! mmmm, bread. mmmm, chips. I have a potato chip addiction, so I can't keep them around or I'll inhale them. I have a few more GF products to blog, too.